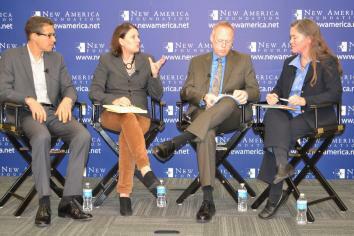 Future Tense event recap on technology and the obesity crisis. Can Better Technology Solve the Obesity Crisis? A Future Tense Event Recap. For a little while, it seemed that the Wii Fit and similar exercise games might be a, if not the, silver bullet for the obesity epidemic. The idea made sense: If kids and adults alike are going to play video games anyway, we might as well make them sweat while they do it. Win-win! But as anyone who has ever played sports knows (even someone like me, who always cowered at the ball), perseverance is key to getting in better shape. Just because the Wii Fit didn’t change everything doesn’t mean that technology can’t play a role in making people healthier. On Nov. 14, Future Tense—a partnership of Slate, the New America Foundation, and Arizona State University—hosted an event called “Technology and the Future of America’s Waistline” to discuss how food engineering, social engineering, self-tracking gadgets, and other technologies might be able to help fight America’s obesity epidemic. Speakers at the two-hour event came from the worlds of business, journalism, academia, and policy. While each approaches the topic of technology and health from a different perspective, all agree: There is no single solution to the obesity crisis—we can’t wait for a Mark Zuckerberg-type to invent something that will make everyone think kale salad is just as tasty as Flamin’ Hot Cheetos. But technology has a definite role to play going forward. The event began with remarks from Alexandra Brewis-Slade, the director of operations for Arizona State University-Mayo Obesity Solutions. An anthropologist by training, Brewis-Slade is interested in the question of fat stigma and the role it plays in the obesity epidemic. “The one thing we do know is shaming people … actually undermines rather than encourages weight loss,” she said. The overweight face bullying at school and are less likely to get into college or get a job offer. That’s because a weight problem is seen as a moral failing. Furthermore, fat stigma—which used to be a largely Western phenomenon—has spread around the globe. The problem of obesity, she says, has become far too large and complicated to fix by yelling at people. So what does that have to do with technology? A lot, actually. After her presentation, Brewis-Slade joined a panel with David H. Freedman, contributing editor at the Atlantic and at Inc. and consulting editor for Johns Hopkins Medicine International; Robert C. Post, chief science officer of FoodMinds and the former associate executive director of the USDA’s Center for Nutrition Policy and Promotion; and moderator Laura Helmuth, the science and health editor at Slate, to discuss whether we could engineer food to make it healthier. Picking up on Brewis-Slade’s exploration of the social dimensions of obesity, Freedman discussed an idea he recently proposed in the Atlantic: engineering junk food so as to make it lower in calories, sugar, and fat. Freedman believes that while farm-to-table and fresh-is-best is all well and good, the fact is that lots of overweight people like junk food. (As someone who occasionally indulges in Kraft macaroni and cheese out of nostalgia for that scrumptiously artificial neon-orange sauce, I know what he’s saying.) Pontificating about farmers markets is not going to change that. “We’ve been telling people to eat their vegetables” for more than a century, he said—and it’s not working. So instead of shaming people into eating the way we want, why not make those unhealthy snacks healthier? He pointed to Burger King’s “Satisfries” as an example of a food that tastes virtually identical to the real thing, but that isn’t quite as bad for you. But Freedman said readers were “outraged” by his Atlantic piece, finding it sacrilegious. Post agreed that “stealth improvements” can be crucial to making food healthier. But he also advocated for empowering people to make their own informed choices, rather than telling them what to do. For instance, he said that the USDA’s SuperTracker has become a popular way for Americans to monitor their choices and learn where they might make positive changes. Russell, whose company makes health monitors that are used by soldiers, athletes, and others who require a high level of fitness, says that for the concept of self-monitoring to reach wide appeal, the gadgets need to contain elements of “socialization, entertainment, some gamification.” Ammori, for one, appreciates gamification: He spoke about how he strives—and strides—to get the “trophy” that his favorite health app gives him each day he walks a certain amount. But Russell later cautioned that gamification can be oversimplification—it alone won’t motivate people to lose weight. Furthermore, Russell said, it’s not just about watching the numbers—it’s about having a community that can give you feedback, help you set manageable goals, and make it fun. But he cautioned against getting too granular: “Gadgets collect data, but you don’t want to look at the data every day.” Rather, occasional reminders from your gadgets can be more effective in, say, encouraging prediabetics to monitor their diet more closely. Jacobs focused on the stick-to-it-iveness problem by noting that one-quarter of all people who download a smartphone app for health tracking use it only once. Furthermore, about the same proportion ends up using it 11 or more times—so basically, about 75 percent of the people who download these apps don’t use them regularly. People rapidly become bored or frustrated. Thompson echoed that by saying that while it’s encouraging that people are using apps, many of them are the ones who already are eating well and exercising regularly—it’s the rest of the population we need to worry about. “Who’s using these apps? And is it really reaching … the people who are not motivated to exercise, the people who are not motivated to diet and to lose weight?” He suggests that doctors may need to create “prescriptions” to encourage reluctant patients use the monitors. And while Freedman spoke earlier about his enthusiasm for the Satisfries, Thompson brought up a counter-example: the adult happy meal (or “Go Active Meal”) that McDonald’s rolled out to much fanfare in 2004. The product turned out to be a bust, because people weren’t interested in the pedometers and healthier foods that came in the pack. So right now, the health technology space is growing in ways that are promising, but not yet major lifesavers for the majority of people who have weight problems. Meanwhile, people continue to watch TV, play video games, and stare at computer screens while snacking. To misquote Homer Simpson: Here’s to technology, the cause of and solution to all of life’s problems.